Dodge has returned as the presenting sponsor of drag's biggest party, the Drag Illustrated After Hours Powered by Dodge. Celebrating its fifth year in 2018, the must-attend event again takes over Indianapolis' Blu Night Club on Thursday, Dec. 6 as part of the annual Performance Racing Industry (PRI) trade show, allowing show attendees the opportunity to enjoy the wildly popular party. 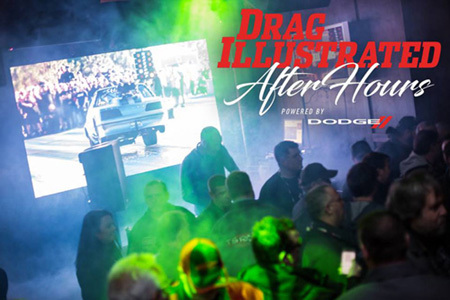 "The Drag Illustrated After Hours Powered by Dodge is again the place to be during the PRI weekend and we're extremely excited to have Dodge back with us for a second straight year," said Wes Buck, Founder and Editorial Director, Drag Illustrated. "The event somehow seems to get even bigger and better every year, and I know I can't wait to celebrate in Indy with thousands of my closest friends." "It's amazing to see so many people from the sport converge at Blu Night Club on one night for this party," Buck said. "It makes you really proud to be part of this sport when something like this comes together. It's so memorable and fun to have the top stars in nitro racing to amazing Pro Mod drivers to big-money bracket racers to eighth-mile drag racing standouts come together for one night at the Drag Illustrated After Hours Powered by Dodge. Drag racing is so diverse and so interesting, and the night turns into a perfect representation of the sport."